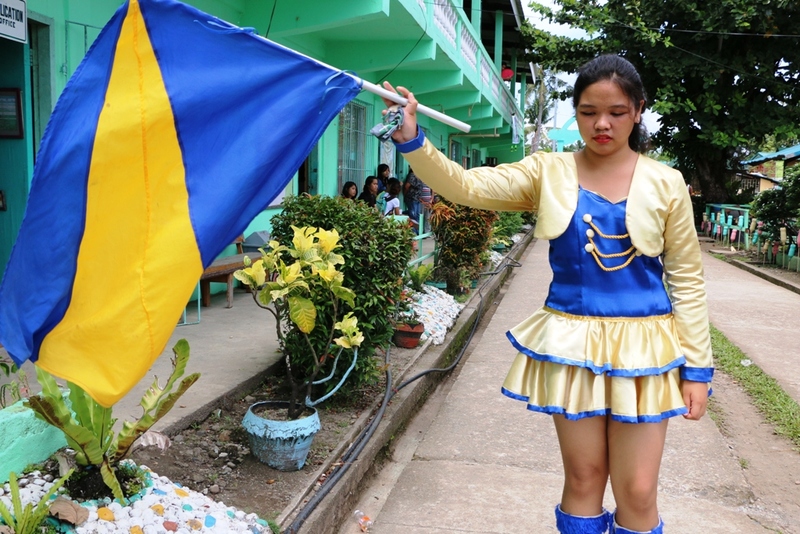 The Drum and Lyre Band is one thing, aside from their Yolanda experience, that connects Quesha and Arianne. The mention of the word “Tacloban” brings immediate tears to Quesha as she started sharing her experience from the tragic typhoon 2 years ago “Waray kami sabot… Waray kami sabot…” (We didn’t know, We didn’t know) she kept saying. Before the typhoon happened, they were advised of the storm surge however, they didn’t really understand what it was. Quesha and her brother were shocked to see what occurred in their house. Crying, she recalls, “Waray kami sabot na nganhe na ngayan ang tubig. Ginkagto ak kuwan balay namon, adto pagdao namon gintaas na ang tubig. Second floor adto nga tubig. Waray kami sabot.” (Hindi namin alam na darating na yung tubig. Mga second floor yung taaas… Sa bahay, ang taas na ng tubig. Hindi talaga namin alam.) She added that they checked the streets only to see rows of houses blown down by the typhoon. Panic has risen between the two but Quesha’s brother managed to tell her what to bring as they try to go to a safer place. Just to survive, they had to climb at the roof until the nightmare was over. Two years after, Quesha can still remember the horrors they experienced during the storm. The torn down houses and dead bodies she had seen brings a traumatic experience she will never forget. Forget it. It Was Just a Dream. Arianne, on the other hand, has the exact opposite reaction, when asked about Yolanda. 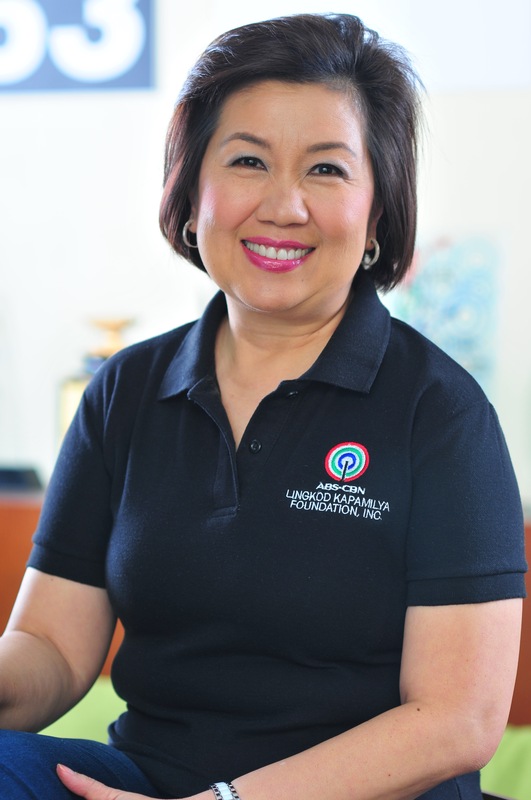 She and her family were in Tacloban, too, when the storm happened. Their house was near the river so they decided to go to a hotel to evacuate without realizing that the hotel is near the sea. Between three and four in the morning, her family on the second floor of the hotel heard noises from the other guests occupying the first floor. Windows were broken; water has entered the hotel filling and destroying its first floor. Arianne’s dad tried to check what was happening downstairs and saw the water rising up by the stairs. Arianne got really scared. There were too many people on the second floor that she thought it could collapse anytime. The next day, after waiting for the water to subside, Arianne’s family left the hotel and walked outside to find a vehicle going to Dulag, Leyte. “Marami din po kaming nakita na patay sa kalsada tas yung mga bahay talagang giba silang lahat.” (We saw a lot of dead bodies along the road and the houses were really torn down). 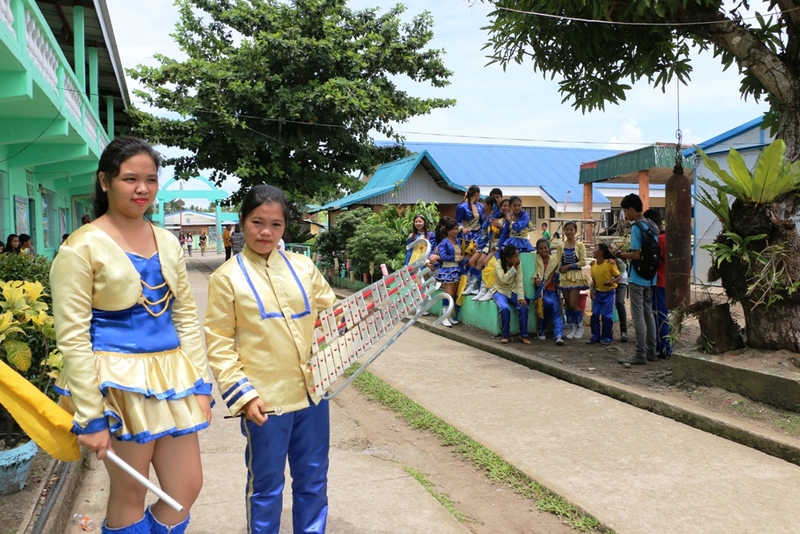 Together with other students, who are victims of Yolanda, Quesha and Arianne are members of the Drum and Lyre Band of Dulag National High School. Quesha is one of its lyrists while Arianne is a flag bearer. 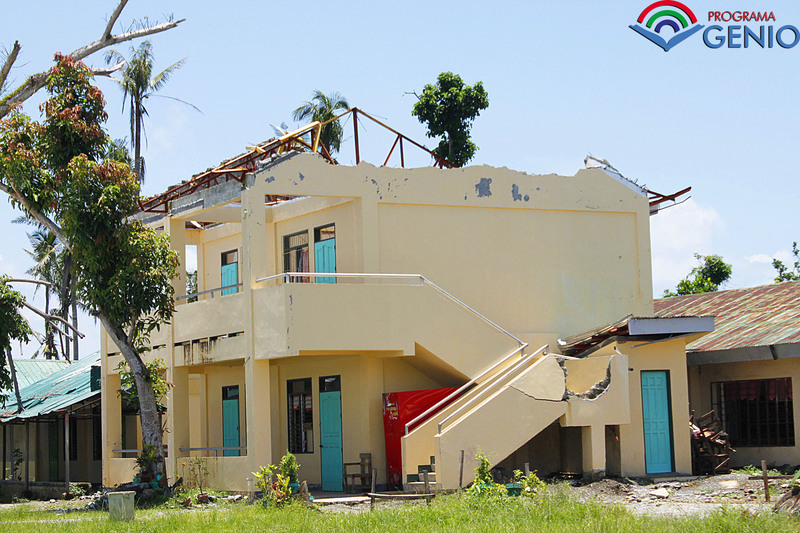 Dulag National High School was also one of the affected schools by the typhoon. Their classrooms were heavily damaged, especially those that had second floors. They were forced to shut down classes for weeks and students had to take remedial classes to catch up with their lessons. Now, the school has seven newly constructed classrooms that are typhoon-resilient. It was designed to withstand 250kph wind velocity. 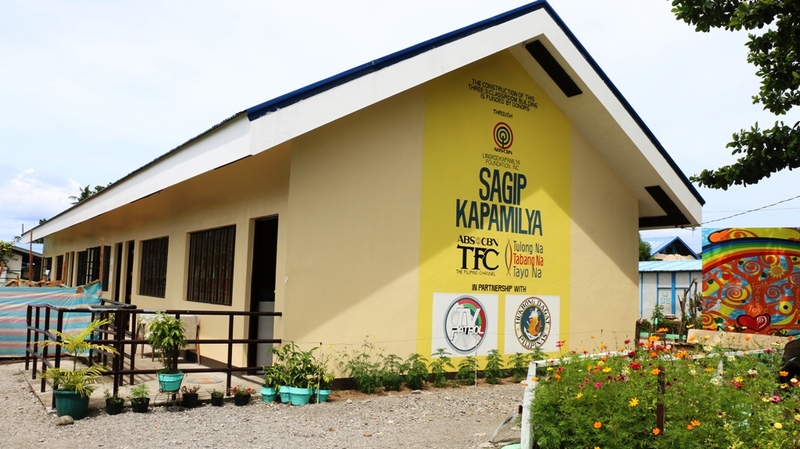 These classrooms were built by ABS-CBN Lingkod Kapamilya Foundation’s Sagip Kapamilya and partners from the donations of the public. The rooms were made with high ceilings and lavatory facilities. After the typhoon, the school’s musical instruments were damaged and others were stolen. 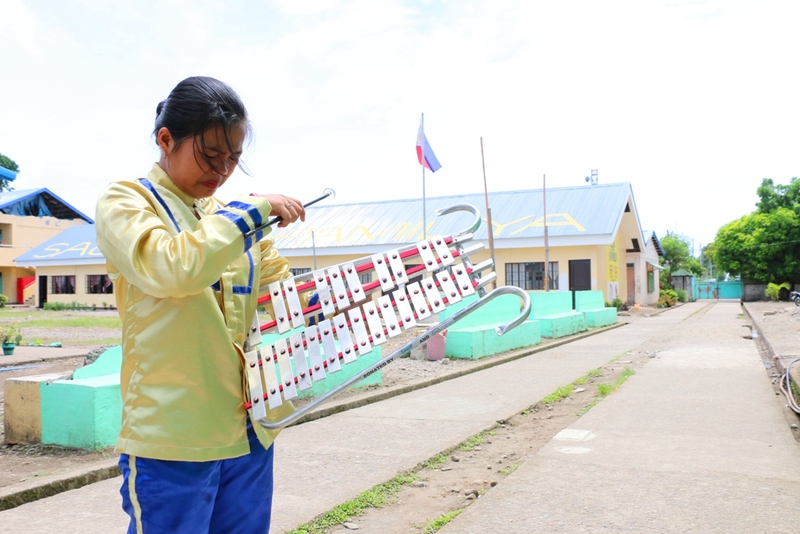 Through ALKFI’s educational arm Programa Genio, Dulag National High School was given a new set of drum and lyre instruments. The music has somewhat eased the emotions brought by the storm. “Pagdating ng Programa Genio, nalaman nilang may mga bagong instrumento na ibibigay samen, lalo silang naging masaya,” (When Programa Genio arrived, the students found out about the new instruments that will be given to us and they were really happy about it) says the school’s Band Coordinator Teacher Winnie Relador. “Nung dumating yung mga instruments, nagpa screening ako kaagad para sa mga bagong members, para mabuo ulit yung banda.” (When the instruments arrived, we had to immediately conduct screening for new members so we can form the band again) she adds. Giving musical instruments is under the Pistang Genio project of ALKFI’s educational arm. With this, aside from giving the students the avenue to showcase their talents, it provides a therapeutic intervention while recovering from the nightmare of the past. Quesha and Arianne signed up as band members soon as the 2015 classes were opened. As Quesha makes different melodies with her lyre, one note at a time, the music helps her forget the experience she and her brother had 2 years ago. On the other hand, Arianne waves her flag like a fairy’s magical wand. The bright colors resonate and symbolizes a brighter and more colorful days ahead of them. Little by little, with the help of everyone, the interventions given to the community of Dulag, Leyte is seen, felt and heard through the magical music of the Drum and Lyre Band.